This North Boulder home was originally a cottage built in 1956. Over the decades, four disparate additions had been made, resulting in a space that felt confusing and disjointed. The homeowners were in search of a solution that would unify the space and introduce functionality. Additionally, the homeowners were committed to preserving their home by pursuing a remodeling process, rather than “scraping” the structure and building something new. Our team at Gettliffe Architecture was able to collaborate with the homeowners to discover design solutions that resulted in a remodel that was both ecologically and economically sound. Gettliffe Architecture’s design fuses preexisting elements, shapes new areas of focus, invites natural light and warmth, and creates flow. The home is transformed from its prior iteration into an airy, functional space that retains its original character (and original square footage). Additionally, the energy efficiency of the structure was significantly improved through green technologies and design techniques. Remodeling VS Deconstruction VS Demolition: Remodeling was the “green” choice for the project. Our estimate is that the remodel produced 4% waste of original building materials, verses the 20% that would have been produced by a deconstruction with reuse of some materials, and verses the 100% waste that would have resulted from a total demolition and rebuild. 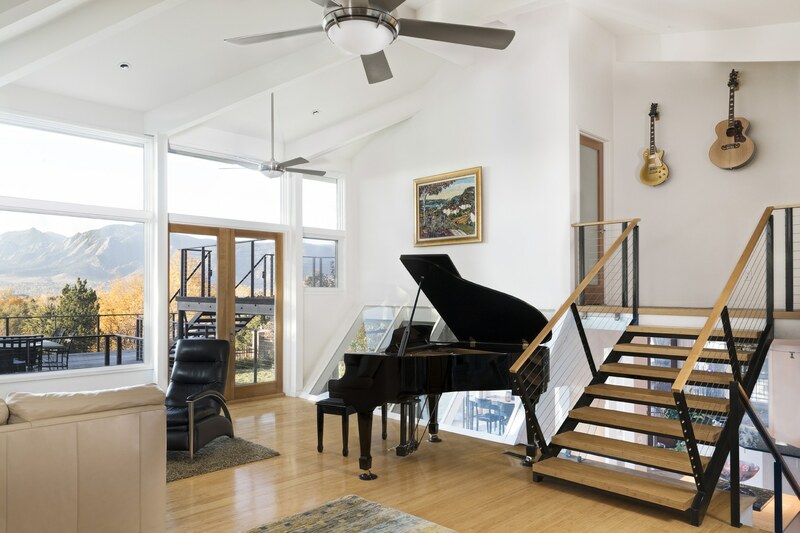 Sustainable Materials: With sustainability in mind, new bamboo flooring, improved wall insulation with blown cellulose, contemporary low emissivity double-paned windows, and a clean-burning pellet stove, were incorporated into the remodel. Connection to Nature: A new 1,157 ft deck system was constructed, affording views from 3 levels of the Flatirons and Boulder, and increasing living space with outdoor “rooms.” The deck is offset to allow sunshine into the lower level of the home. The remodel took place in two separate phases of design and subsequent construction. After completing the remodel of the entryway, living area, kitchen, “bridge,” bedrooms, and bathrooms, the homeowners returned to Gettliffe Architecture a few years later to remodel the indoor pool area into an expanded family room, and spa. You can see before and after pictures of the Family Home Transformation on the Gettliffe Architecture blog.